Imagine the scene. One 14-year-old deaf boy who also can’t speak and has other health issues. One 30-year-old deaf woman who can read lips and knows sign language. One 60-something woman who is an interpreter for the deaf. And one 58-year-old visually impaired woman who doesn’t know sign language and can’t see the intricate detailed signing anyway. All gathered around a table playing Uno. That’s the situation I found myself during the International Conference on Missions (ICOM). Oh, I forgot to add a 79-year-old woman monitored our play and took pictures. Thank you, Aunt Katherine! As Aunt Katherine and I moseyed through the Exhibit Hall, we saw my good friends Pam and Bryan Eubanks, directors of the Deaf Institute. This wonderful ministry serves the deaf community primarily in the Cincinnati, Ohio area. Their booth at ICOM portrayed the trademark for which they are best known – building relationships. Unlike other booths that hosted nothing more than a display table and a couple of chairs, Pam and Bryan had situated a round table that edged into the walkway. Their hope was that their booth could become a hang-out, especially for teenagers. I don’t think Pam anticipated the mixed group that gathered around the table that Saturday afternoon. When I passed by their display, Pam waved me over. As Pam introduced me to the others, we realized we had some competing challenges. Their deck of Uno cards was hard for me to read. The deaf players couldn’t hear announcements of color changes and I wouldn’t know the sign language gestures even if I could see them. I couldn’t tell how many cards people held in their hands and the deaf people couldn’t hear the announcement of “UNO” when someone had one card left in their hand. We made accommodations by announcing each card we put down, both verbally and through sign language. Signs for a color change and requests about the number of cards left in each person’s hand were made with over-dramatic gestures and tonal expressions. We giggled over the draw four cards and groaned when someone who was almost ready to go out got blasted with a fistful of new cards. Whenever someone came down to one card, they pounded the table twice and shouted, “UNO!” No one could miss that cue, including passersby. They must have wondered how five people could get so excited about a card game. If they only knew! Wondering how much Beni could comprehend how to play the game, the temptation was to go easy on him. No worries. Beni took exquisite pleasure in pounding me and Angela with Draw Two cards. He never won a game, but from the grin on his face, you would think he was the King of UNO. I blush to admit it. Playing Uno with a couple of deaf people was one of the highlights of the ICOM experience for me. And it made me wonder. 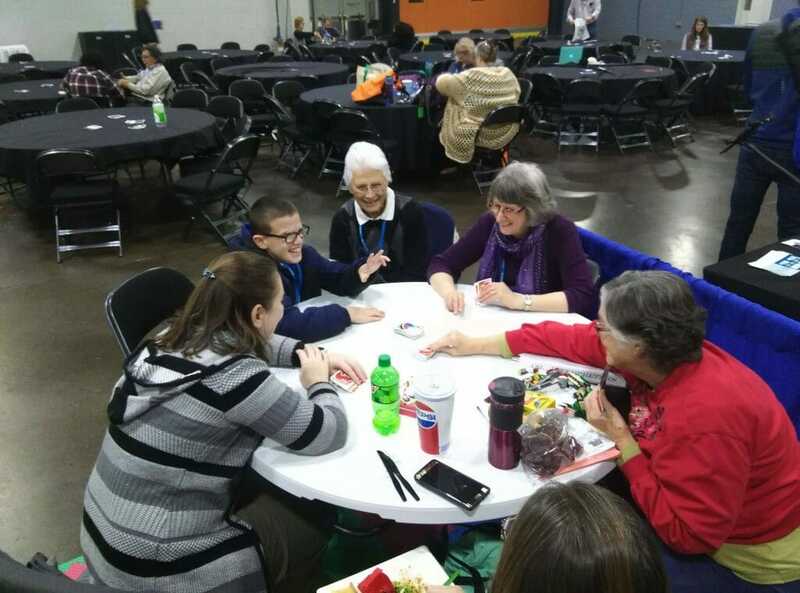 If one visually impaired woman and two deaf people can find accommodations in playing Uno, why can’t other groups of people in the world learn to get along with each other? After all, unity is not about all of us being like each other. Unity is the ability to work together in spite of our differences. No, it’s more than that. We reach unity by working together through our differences and finding ways to accommodate each other. We have the courage to find alternate ways to get the job done, so everyone can be an equal part of the team. Together, as a whole, we become strong. What accommodations do Christians need to make as we work together to advance the gospel message? Perhaps Pam and Bryan are on to something. It’s all about building those relational moments. As we learn to get along with others who are different from us, we strengthen our connections. When we are strong together, we earn the right to share with unbelievers how to build relationship with the Creator and Redeemer of the world. It could start with something as simple as a game of Uno.